To begin making the Paneer Pancake Recipe (Homemade Cottage Cheese Pancake), we will first grind the paneer in a food processor until smooth. Add sugar and beat for some more time so sugar is dissolved in. Stir in the smooth paneer, baking powder, plain flour and salt to the beaten egg mixture. Add the milk and whisk to combine well. You should have a thick pancake batter. Heat a skillet over low heat. Melt some butter and pour in a large ladle of the paneer pancake batter on to the pan. The batter to spread on its own and settle down. When you notice the bubbles appear on top, flip over and cook the paneer pancake the other side. Once done, proceed the same way with the remaining batter and transfer to serving plate. Serve the Paneer Pancake topped with fruits and honey or a maple syrup as a wholesome high protein breakfast. 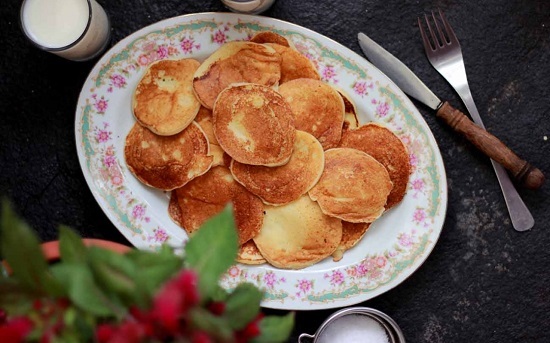 The Paneer Pancake Recipe light and fluffy pancakes with a distinct creamy taste that comes from the use of paneer or Indian cottage cheese. Your kids are going to start their day on a happy note if you give them this for breakfast, and the good dose of proteins from paneer and eggs will put you at ease too.